The figure of the vampire has been around for centuries, and has lost none of its fascination. Although, the portrayal of the vampire in literature today has not much in common with its historical origins, the vampire belief is based on true events. Bram Stoker's novel ‘Dracula’ laid the foundation for the success story of the vampire. He created something sinister, a monster in the shape of a gentleman. The evil of the Victorian society was personified in the form of the revenant. Boundaries between good and evil, human and non-human, death and life are blurred and unrecognizable in his book. In contrast, Anne Rice creates a world where humans and vampires live next to each other. Her vampires resemble human beings not only in terms of their bodies, but also in terms of their minds. There is no horror detectable, but amazement and identification with the revenants by the reader. 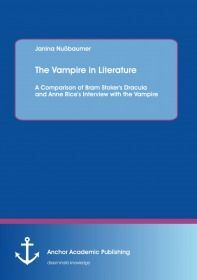 In this context, the differentiation of the constructed images of the vampires in the two novels, ‘Dracula’ by Bram Stoker and ‘Interview with the Vampire’ by Anne Rice, is analyzed. Thereby, the study investigates those elements that have been adopted, those ones that have developed over the time, and the consequences that go along with the manner of construction.